BBA from IGNOU is a 3 years undergraduate professional course that the university offers under distance education mode. ​The Bachelor of Business Administration course offered by Indira Gandhi National Open University (IGNOU) is of of the top ranked distance education BBA courses in India. The IGNOU BBA course is offered by the university under The School of Management Studies, which is the management studies wing of the university. The School of Management Studies was established in the year 1987 and offers various professional courses in the field of management studies including the IGNOU distance education MBA. IGNOU has divided the BBA in retailing eligibility criteria in two categories. Final selection in IGNOU BBA will be done based on the personal interview conducted at IGNOU regional center. The Regional Director, in consultation with the Programme Coordinator, will conduct the interview. In interview, candidate is required to score 25 marks out of 50 marks to qualify. If a candidate is working in a retail organization and meet the eligibility criteria of 10+2 or equivalent, the organization and nominate the employee as an sponsor for admission in IGNOU BBA in Retailing. A letter issued by competent authority from the company on the latter head is required to be submitted along with an individual application form of the candidate nominated. If selected, candidate needs to submit the fee through a demand draft in favor of IGNOU payable at New Delhi. For more details regarding IGNOU BBA fee, students may contact the nearest regional center or refer to the prospectus. The IGNOU BBA admission procedure is quite simple. 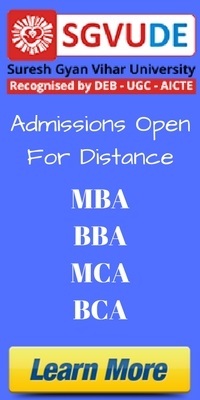 Here are the steps you’ve to follow to get admission in distance BBA from IGNOU. Check Your Eligibility: If you’ve completed 10+2 or a equivalent course, you’re eligible to take admission in IGNOU distance BBA in Retaling. Fill up the Admission Form : Visit your nearest IGNOU regional center to collect the admission form for BBA from IGNOU. IGNOU accept applications for admission in distance BBA program once in year in the month of July. Submit the Application Form: After filling up the application form, attach the required documents and send it to IGNOU. Appear in Interview: Final selection of students is done through the interview process. All students who score 25 marks out of 50 gets an admission in IGNOU distance education BBA course. The total duration of BBA from IGNOU is 3 years. A candidate may complete the course in maximum 6 years. Students from the age of 18 years to 24 years are eligible for admission. IGNOU follow a modular approach for distance education BBA. On completion of 1st & 2nd year, students are awarded with a diploma. After completion of the final year, a degree is awarded to all students. Here are more details on this. All students go through a 3-month training in the first year of IGNOU BBA in Retailing. On-The-Job training is also provided to all the students in 2nd & 3rd year of BBA from IGNOU.